How Glasgow Flourished 1714–1837. A temporary exhibition on show at the Kelvingrove Art Gallery and Museum in Glasgow until 17 August by Dominic Bascombe, Assistant Organiser, National Union of Journalists in Scotland How Glasgow Flourished is a wide ranging exhibition covering much of the city’s development through the 1700s under the reigns of the Hanoverian kings George I, George II, George III, George IV and William IV, right up to the start of Queen Victoria’s reign. With some 230 objects, 40 per cent of which have not been previously on public display, it should come as no surprise that like the city’s international connections, this exhibition was deliberately conceived to coincide with the Commonwealth Games being held in Glasgow. Contrary to popular belief, much of the city’s landscape was developed during this 1700s period including the open spaces of George Square, Buchanan Street, and Argyle Street. An often overlooked period, the exhibition shows how famous Glaswegians came up with ideas and inventions that changed industry and trade across the globe. However one aspect of the city’s history that isn’t hugely covered is its connections with the trans-Atlantic slave trade. Last October, celebrated internationally as Black History Month, the Scotland office of the National Union of Journalists hosted an event at the Mitchell Library in Glasgow, looking at Scotland’s connection to slavery and the Caribbean. A key criticism from participants was just how little that connection between Scotland’s largest city and the horrific slave trade was discussed at a national level within Scotland. This exhibition, unfortunately does not take us much further in that discussion. Whilst the exhibition does mention the city’s slave trade links, there is little depth to it. Quite rightly, the exhibition does point out that Glasgow’s slave connections are still present in many of the city’s landmarks and street names including Jamaica Street et al. But it is also present in other famous buildings such as the Mitchell Library. Why is this not better known? Why are there no official commemorations of the city’s slave links? Most importantly why has the city, and indeed the country, not seen fit to publicly recognise its slavery connections through a broader public education initiative and possible apology or at least an official position of ‘regret’? Scotland’s influence continues to be felt in the Caribbean today as many Scots settled there, running plantations and creating families. 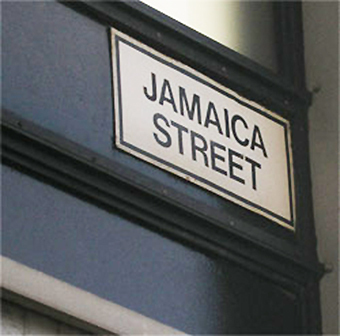 Scottish family names and landmarks can be found across many of the islands, Jamaica and Barbados in particular. For example, Hampden was one of Jamaica’s oldest sugar and rum estates. The house there was built by the Stirlings of Keir in 1779. With the opportunity to send crops from the Caribbean back to Glasgow for refinement, slavery was a cheap way to keep production costs low and price of the products competitive. In fact Scottish merchants encouraged others to join in exploiting the trade in humans. George Bogle III wrote many letters from India to his family at Daldowie House near Glasgow informing them about the cheap Indian labour available, as an incentive for fellow Glaswegians to invest there. Whilst the ‘How Glasgow Flourished’ exhibition does provide an overview of a very specific period of the city’s history, it is important that Glasgow and indeed Scotland is better informed about its connections, and in particular its connections with slavery. Let’s be completely open about who we are and how we got here. A national exhibition examining this in more detail, alongside increased focus in schools, perhaps during Black History Month, would be most welcome.